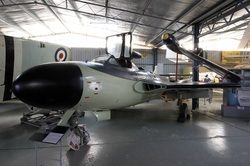 Developed from the de Havilland Vampire, the Sea Venom first flew in 1949. Powered by the de Havilland Ghost engine it was around 160 km/h faster than the FB-9 Vampire with double the rate of climb. Designed as an all-weather interceptor with a capable radar fit-out the aircraft doubled as an effective ground-attack weapon with 4 x 20mm cannon and air-to-ground rockets. Australia acquired 39 Sea Venoms to replace the ageing Hawker Sea Fury and the newly commissioned HMAS Melbourne operated them from early 1956. 808 Squadron, R.A.N., became the first Australian unit to operate the Sea Venom and eventually 808, 805 and 816 Squadrons flew the aircraft and the Navy’s aerobatic team, the Ram Jets, demonstrated the aircraft at airshows throughout the nation. Replaced by the Douglas A4C Sky Hawk the Sea Venom served as a target tug with a distinctive yellow and black colour scheme in the early 1970s and it was not until 1973 that the last Sea Venom was deleted from the Fleet Air Arm’s roster. The Museum’s aircraft is has been undergoing some extensive refurbishment of the forward fuselage which being of wooden construction had suffered considerable deterioration over the years.